Brittany France Travel Vacations to French Beaches and Traditional Foods. 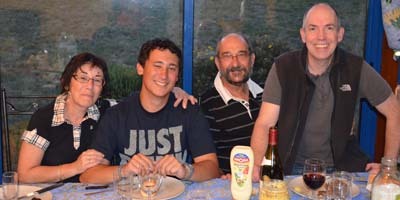 This is a blog of our vacation in Brittany visiting French family and enjoying the culture of this beautiful part of France. I write this so you can get a sense of places to visit that the locals know about and few tourists. And the culture of this region of France. Woke up in the comfortable guest room of our cousins Paul and Marie-Paul in Malguenec just outside of Pontivy in Brittany France. 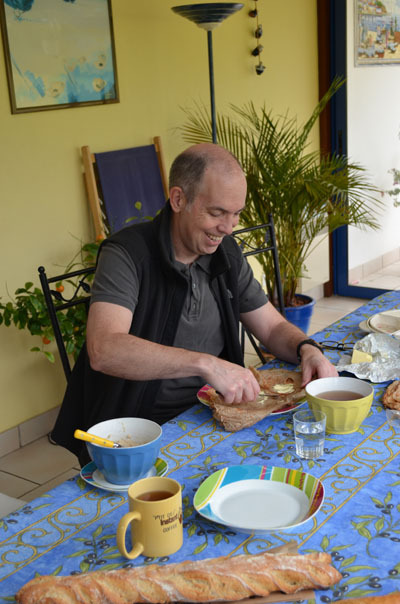 Gildas enjoying a typical Breton breakfast of buckwheat crêpes, and French baguette all with Breton butter! Coffee is drunk out of the big bowls. Ok, so you don’t have cousins to stay with, there is a very comfortable Ibis just outside of town where we stayed last time. 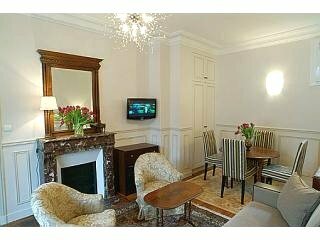 The Ibis hotel France is my favorite choice for France budget travel. 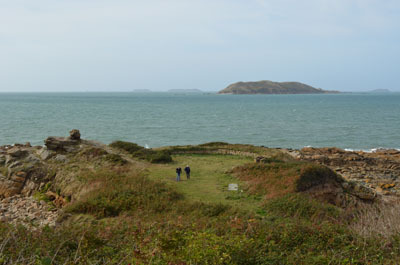 This is the south of Brittany in the Morbihan department. 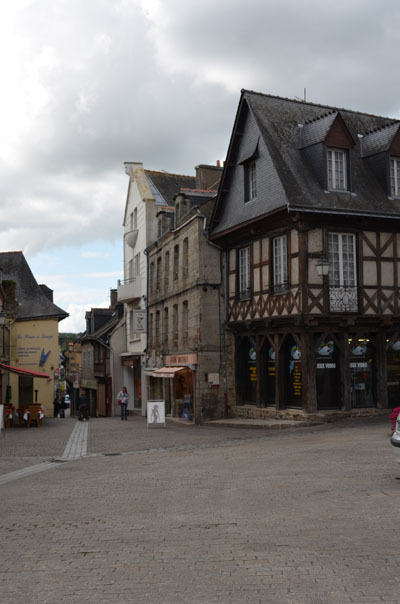 Pontivy is inland about 1 hour from the coast and the beaches on the Golf de Morbihan . 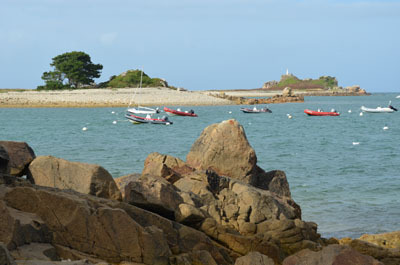 Great sailing, swimming, water sports… French beaches on the Golf de Morbihan are a great choice for Brittany France travel vacations because it is the warmest water and sunniest weather(usually). This is where we rented our cottage (gite) last visit. see Brittany cottages France for more info. 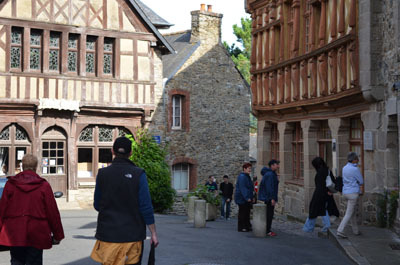 We had lunch in the beautiful old section of Pontivy, which is lined with medieval houses and cobblestone streets. Our cousins recommended the restaurant “le Martray”, 32 Rue Pont, for really good food at but we were too late for lunch. Instead we ate in the same area at a restaurant called Le Colibri on Place du Martray. I ate what they called camalu, a white fish, but too fishy tasting for me and Gildas ate a salad. This was Monday and the custom of French culture is that almost all banks are closed on Monday. We forgot before we left to exchange money for Euros or at the airport even. Don’t forget. I couldn’t buy anything at open street stalls because we only had a credit card. Plus, in modern French culture now banks do not carry cash. If you want cash you get it from the ATM. For money exchange you need to get it from a currency exchange place. Gil went off to see some family and I rested at our cousins in the sun room. We finished the day with a barbeque at the house. Their son Tomas who had just returned that day from a summer English language program in San Diego. We ate Merguez Moroccan lamb sausages (much less spicy than in the states), lamb chops (much more tender and delicious than the states), and pork sausages. Paul stoked the coals with a hair dryer (never seen that before!) I wish I took a picture. 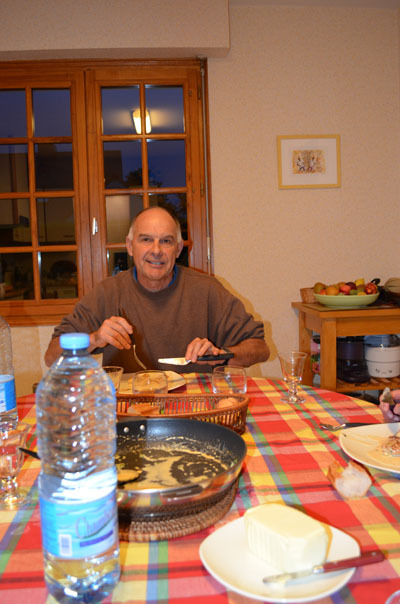 Today we left Paul’s (but we’ll meet up again on the 2nd leg of our trip) and drove to Guingamp, the home town of Gildas’ mother 1 hour to the north. We met another cousin who showed us his woods. It is very interesting that in the culture of France the government will pay half the cost to plant a forest on your land for future wood production. It takes years before you get anything but when it’s harvested you split the revenue with the government. There are arborists who work for the government who help you keep the trees in good growing condition and harvest when ready. At tea time we ate delicious pastry and tea at Salón de Té in Guingamp. Lovely place to eat and rest. Late afternoon we drove north to the Pink Granite Coast and the town of Louanec, just outside of Peros Gueric. To the home of cousins Isabelle and Christian. Still jet lagged we visited and watched her make dinner and ate. She whipped up a salad with shrimp and tomatoes, sautéed scallops in beurre blanc sauce, string beans from the garden and pears from the garden for dessert. Not to mention the cheese plate for dessert as well. 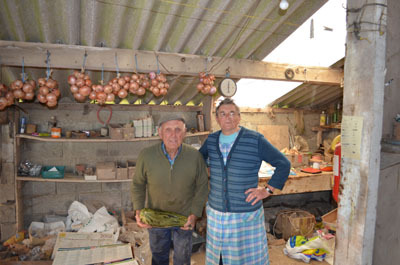 In Brittany France Traditional French foods and popular French food include seafood, especially shellfish. In culture of France sautéing is a standard way of preparing French food at home, like meats and fish. We stayed in another comfortable room and slept well. We saw plage Trestignel, Plage Trestiam, the town of Ploumanac’h Plage, Saint-Guirec, the Port de Saint-Guirec and La Clarte. French beaches are called “plage” in French. 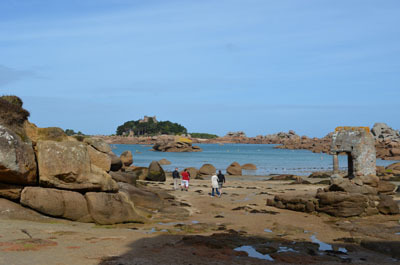 Brittany France beaches on this coast are of beautiful pink granite rocks and wide sandy stretches in between. See more on the Brittany beaches in France. 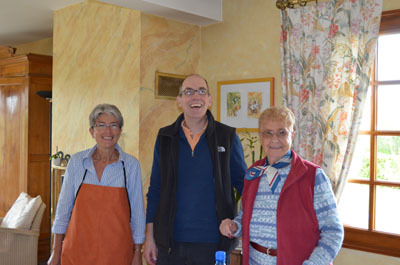 Home on time for lunch, Gildas’ aunt Jacquline joined us. 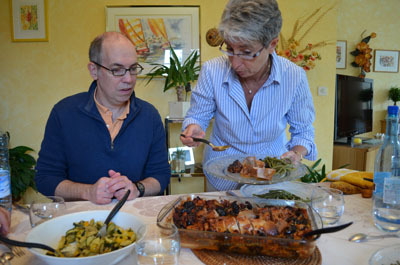 Lunch was French food at home with another amazing meal of Isabelle’s. It was pork roasted with prunes and sun dried tomatoes, string beans from the garden, potatoes, ratatouille, and chocolate mousse See her easy chocolate mousse recipe Isabelle made it especially for me because she remember how much I loved it the last time we were there and she whipped it up the night before. Truly an amazing cook. After lunch we all took off for Tréguier Cathédrale. St. Tug Dual (aka St Ives, St Erwan) is buried here. He is the patron saint of lawyers. 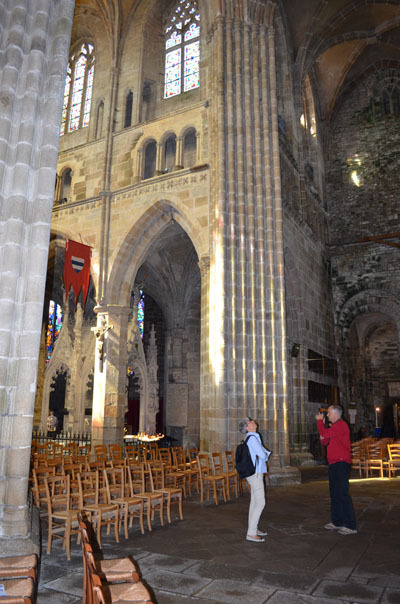 I was still very jet lagged and dragging yet when I walked inside the cathedral my energy returned and I felt great. It was truly a special place and very beautiful and calm. 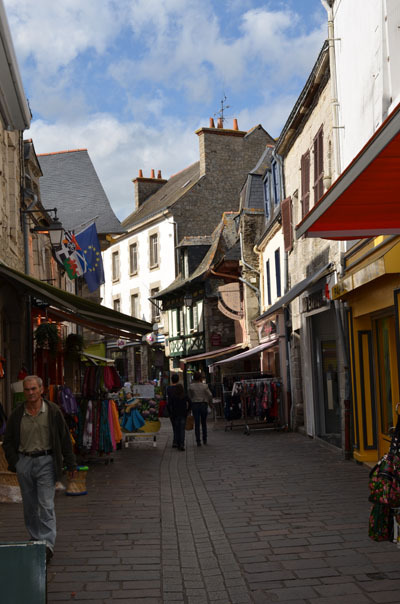 Tréguier is a beautiful town with lots of great shops. I bought a Brittany striped sailor shirt (mine at home has a hole in it from so much wear), and we bought some Brittany sea salt with seaweed (sel de Guérande). Brittany sea salt is very famous, great for cooking and full of healthy benefits. After that it was on to Cloître, then Port Blanc (where my camera lens cover leapt into the bay). On our way home we visited Christian’s parents. They have a farm by the coast in Trelevern. It was really fun to see the farm and meet them, never met a French farmer before. Dinner was a light meal of sarrasin (buckwheat) crêpes with cheese, ham. I requested the leftover ratatouille as my crêpe filling. Yum. 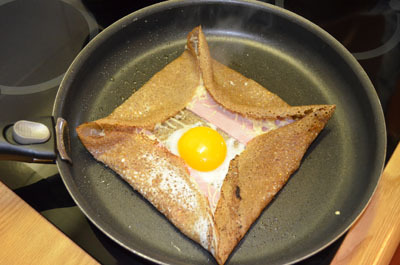 The crêpe, one of the traditional French foods and popular French food in France originated in Brittany. Historically Brittany was very poor but the soil grew buckwheat so they would eat crêpes made of buckwheat for their meal. The most traditional way of eating is with buttermilk, you break off a crispy crêpe into your bowl of buttermilk and slurp it up with a spoon. Gildas always has one that way. I don’t care for buttermilk so I pass. After dinner, tired and happy we plunked into bed. I definitely recommend Brittany France travel vacations. 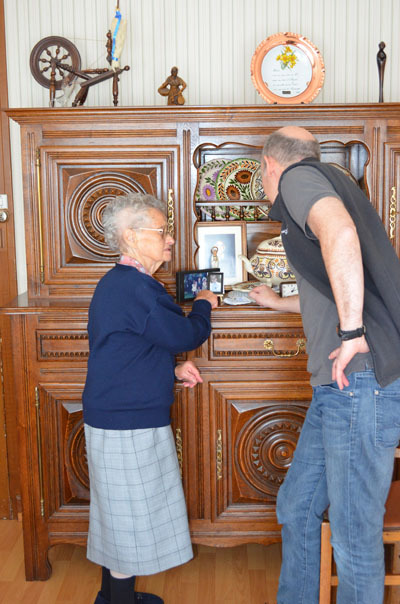 If you want to get close to the culture of France it’s a great choice. You don’t need to have relatives there. Hardly any tourists at all.